Due to family responsibilities this evening, I knew I couldn't go far. I also knew this could be an excellent storm day, though today's setup in Illinois was less conducive to individual supercells and more conducive to a squall line than yesterday's situation in Iowa, which produced spectacular but destructive tornadoes in and near my childhood hometown of Waterloo. Anyway, given my situation today, I figured the best bet was to wait for the front's approach and see what might happen that could permit a short local chase. By around 4:00, I could see that a strong storm was moving eastward toward Macoupin Co., which is one county north of where I live. It had already prompted warnings in Calhoun and Greene Counties, and showed some signs of backbuilding. I figured I could intercept around Bunker Hill. 4:30 - out the door. I headed up IL route 159 from Edwardsville, with the storms visible to the NW as soon as I was out of town. A SVR went up for Jersey Co, just to the west. I headed to a position slightly north of Bunker Hill, just north of where IL route 138 crosses 159. 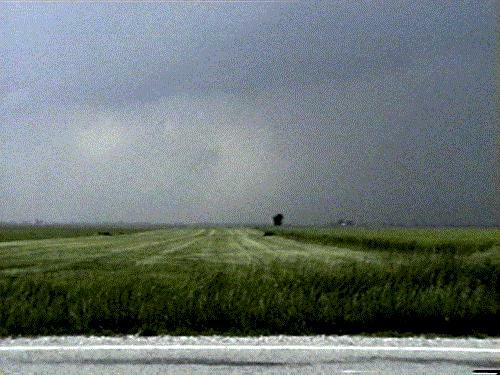 I positioned myself just to the ENE of where the updraft appeared to be, and watched from about 5:00 to 5:20 as a monstrous hailer crossed the highway to my north and approached from the west. A SVR was issued for central and northern Macoupin Co, just to my north (I was in the southern part of the county). 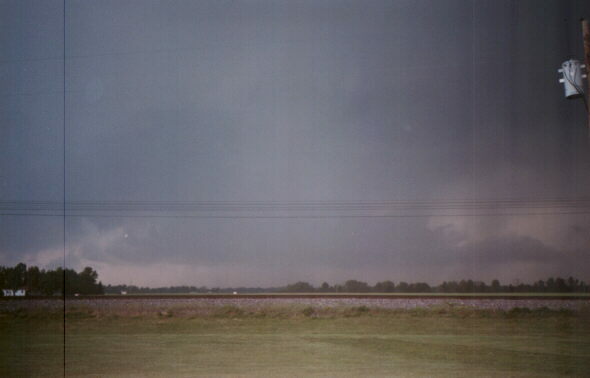 On the front edge was a sharp shelf cloud, which featured occasional brief, small lowerings, but nothing that would suggest an inflow notch or anything of that nature. But I remained in the inflow even as the frequent CG got within about 2 miles. To my west was a spot of thin precip with a hail shaft (video capture here) along the south edge of the heavy precip, with some nice updraft base above the spot where the precip was light. Around 5:20, 2-inch hail was reported at Woodburn, a few miles to my WSW. To the south of the hail shaft and updraft base was another precip core. I could see I was going to get majorly hailed on if I stayed in this spot, so I tried around 5:20 to go east on 138, but no luck - a minor construction project there turned into a major snarl as the workers closed the road to back large equipment off the road into a field they were using for storage. I turned around and went back to 159 and headed south, arriving in Bunker Hill just before the storm, and cut east on the road to Staunton. Getting out of this area north of Bunker Hill proved to be a very good idea, as the area where I had been was hit with 2-inch hail about 10 minutes after I left. 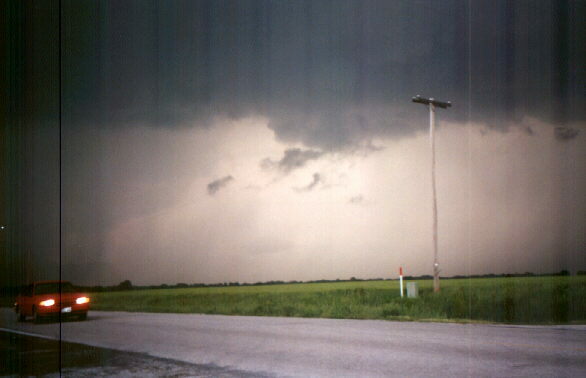 Here is a view to the northwest from east of Bunker Hill, looking toward my earlier location (near or just left of the telephone pole, about 4 miles away) around the time that 2-inch hail was falling there. Note there is a slight lowering and even maybe a hint of an RFD notch in front of it; however this area filled in with precipitation quickly after I took this picture. Once I reached Staunton, I proceeded south on route 4 to the southern edge of town and found a nice place to watch the approaching storm from behind a farm implements store (around 5:30-5:35). The storm was backbuilding and the area of light precip had completely filled in. To the WSW was a large area of updraft, possibly a broad, poorly-defined meso. This structure looked like it had the best potential I had seen all day for rotation - here is a photo of this area, which was already beginning to be partially surrounded by rain. This area had a nice beavertail structure on its northeast edge, but no lowerings. The CG approached and was soon zapping down all around me. As the storm backbuilt, the CG began along the leading edge and under the updraft base. The updraft area then began to occlude, or at least was becoming increasingly surrounded by precip, so I pushed south again. Behind me the sky was incredibly dark and the CG was nearly continuous, and as the storm built to the south and southwest, the lighting came with it. Around this time, golfball hail fell a few miles to the north in Gillespie. My last stop was at a side road somewhere near where route 4 crosses I-55 - don't recall exactly where, but it would have been around 5:40-5:45. I thought I saw a beavertail and an RFD slot in some of the updraft base to my NW. Here is a photo and some additional commentary. Other updraft base was overhead and just to my west - some of the lowest general updraft base I've seen - these storms were definitely surface-based! But then I was hit with the first outflow I'd been in all day, and I was just on the leading edge of this updraft base. I took this to mean the storms were going outflow dominant, and thought it unlikely I'd see anything more here. I decided that what I had seen were just outflow features, and headed south to go home. In retrospect, I'm not so sure that is true. This structure may have been the beginnings of the meso that later produced tornadoes north of Greenville and south of Vandalia. Maybe the outflow was RFD wrapping around the storm. At this time, though, I also heard reports that the storms had generally weakened. Since I had obligations at home, I decided to call it a chase. I headed south on 4 to 143, then headed west the few miles to my home on the east side of Edwardsville. I could see nice towers going up ahead, as the line continued to build south. As I headed west on 143, I realized I was back in the inflow, and a couple miles before I crossed I-55, I got a real blast from the south of inflow racing into the backbuilding storm to my north. I looked that way, and saw a small lowering with lots of scud around it. In front, a scud tag moved from the left to the right. Was this scud cluster rotating? Naw, I told myself, in what may have been a big mistake. Probably just outflow pushing the scud tag along. I continued home, thinking 1) this was just another meaningless scuddy lowering like other small, meaningless, scuddy lowrings I'd seen all day, 2) I had to get home because of my commitments, and 3) the storm building to the west would chase me east or force me into a core-punch if I stopped now. As it turns out, 2 and 3 were true, but 1 may not have been. First thing when I walked in the door I saw the crawler going across the TV screen showing a tornado warning for NE Madison Co. Radar indicated tornado near New Douglas. Although I think the possible rotation I saw was farther down the line than where the meso was detected, had I pursued this east I might have heard the warnings and been able to position myself for what was to come later. Arrgh! Well, at least I got home in time to meet my family obligations. And I may not have missed as much as I at first thought. Although this storm did produce 3 tornadoes, reports from other chasers and from the NWS indicate that tornadoes were rain-wrapped and difficult to see. As indicated in the NWS damage survey, the strongest of these was rated F2, and the first, rated F1, travelled for 9 miles. So fairly significant tornadoes, even if they were rain-wrapped. After I got home a storm went severe just to the south of Edwardsville, and I videotaped the pea-sized hail hitting my driveway as we were on the outskirts of the passing storm. Total chase distance: about 58 miles. Warnings, local storm reports, and the NWS damage survey on the tornadoes the storm later produced can be seen below. All LSRs in Macoupin, Montgomery, Bond, and Fayette Counties are associated with this storm. OUTDOORS. MOVE INSIDE A STURDY BUILDING IMMEDIATELY. AWAY FROM CREEK BEDS AND OTHER FLOOD PRONE AREAS. THE PRIMARY SEVERE WEATHER THREAT IS DAMAGING HAIL. 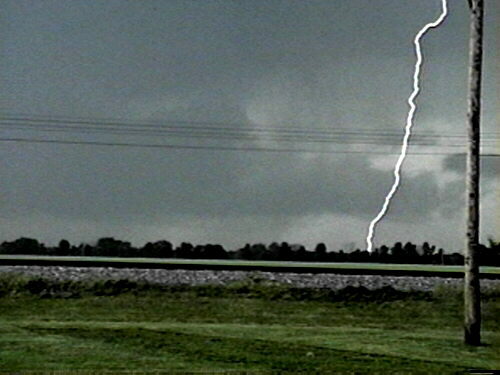 LIGHTNING ARE ALL POSSIBLE IN SEVERE THUNDERSTORMS. FROM WINDOWS UNTIL THE STORM HAS PASSED. ABANDONED IN FAVOR OF A MORE SUBSTANTIAL STRUCTURE. 4 MILES WEST OF THE FAYETTE - BOND COUNTY LINE. MOVE TO A DITCH OR CULVERT AND COVER YOUR HEAD. VANDALIA...MOVING EAST AT 35 MPH. BE ABANDONED FOR A SAFER SHELTER. NOT SEE OR HEAR ITS APPROACH. SOUTH OF EFFINGHAM...MOVING EAST AT 40 MPH. APPEARS THAT THREE TORNADOES OCCURRED ACROSS THESE AREAS. MILES NORTH OF GREENVILLE ILLINOIS AT APPROXIMATELY 635 PM CDT. END OF (F1) WHILE THE DAMAGE WIDTH WAS APPROXIMATELY 50 YARDS WIDE. APPROXIMATELY 3.0 MILES NORTHEAST OF GREENVILLE. MILES...WHILE THE SECOND TORNADO HAD A DAMAGE PATH OF 1.5 MILES.